Many drivers yearn for vehicles that are powerful, roomy, and safe. Thankfully, just such a vehicle exists and it is known as the Mazda CX-3 compact crossover SUV. While this vehicle is indeed roomy and powerful, it also puts a premium on keeping occupants as safe as possible. To this end, this iconic vehicle deploys a number of safety enhancing technologies that include rear cross traffic alerts, blind spot monitoring, and even Lane Departure warning systems. SUVs are bulky by nature, and as such it can be difficult for many drivers to see around the rear of their vehicles. This can make it tough to reverse such vehicles onto busy streets without event. Thankfully, the Mazda CX-3 solves this problem with its proprietary Rear Cross Traffic Alert system. This system activates when drivers put their transmissions in reverse, and can scan roadways behind the vehicle for oncoming cars. It thus makes it very easy for drivers to quickly and safely reverse their cars out of parking spaces. 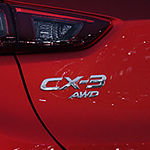 Another specialized system deployed by the Mazda CX-3 is the Lane Departure warning service. During long or even short trips, drivers may zone out or even doze off. The Lane Departure warning can sense when vehicles begin to drift out of place, and then bring the vehicles back onto their proper lines of travel. Plus, this system can also sound special tones to increase driver awareness.